Many people involved in legal disputes prefer to resolve their differences in a meeting room instead of court… to save costs or maintain a more informal, flexible atmosphere. Arbitrators, mediators, and conciliators facilitate dialogue between disputing parties… to help resolve conflicts without entering a court room. 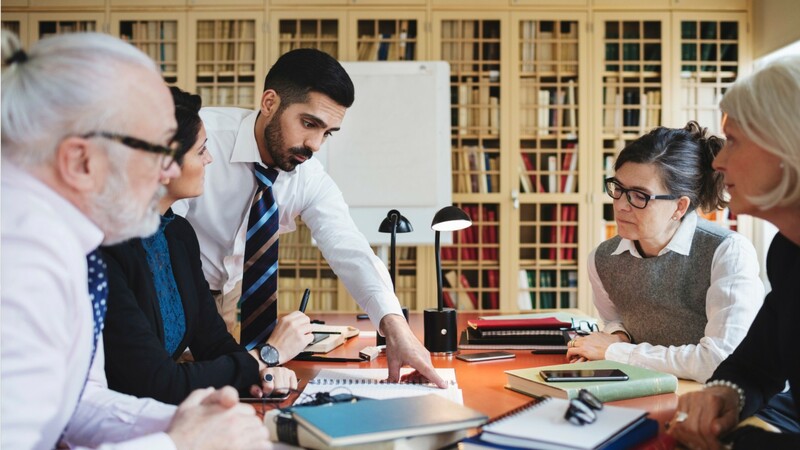 Arbitrators, mediators, and conciliators hold private hearings to clarify the issues and interests of all involved, and encourage parties to find areas of mutual agreement. Though closely related, the three work somewhat differently: Arbitrators hear and decide disputes. They are usually attorneys, retired judges, or business professionals with expertise in a particular field. Their cases may be legally —or voluntarily— referred for arbitration. Mediators are neutral parties who facilitate discussions to reach a satisfactory agreement. If no agreement is reached… they may choose different options… often the court system. Conciliators are similar to mediators, except that they typically meet with the parties separately, and then make recommendations. Most arbitrators, mediators, and conciliators work full time, in either legal services, government, or non-profit organizations, and may travel to different sites for negotiations. Most people who work in these fields have education in another field, such as law or business management, or experience in an industry related to the dispute. Advanced degrees or certificates in dispute or conflict resolution may qualify candidates for some positions. Use mediation techniques to facilitate communication between disputants, to further parties' understanding of different perspectives, and to guide parties toward mutual agreement. Confer with disputants to clarify issues, identify underlying concerns, and develop an understanding of their respective needs and interests. Prepare settlement agreements for disputants to sign. See more details at O*NET OnLine about arbitrators, mediators, and conciliators. Arbitrators, Mediators, & Conciliators by U.S. Department of Labor, Employment and Training Administration is licensed under a Creative Commons Attribution 4.0 International License.